Our first drive with the Skoda Kodiaq left us with very few surprises. It’s evident that with this big Czech bear, Skoda isn’t trying to directly target the Endeavours and Fortuners of the world but offer a more sombre alternative. But with its focus squarely on luxury and tech first, and ruggedness second, is it still worthy of being labelled a genuine S-U-V? We spent a week with the Kodiaq to answer these questions! Red flag numero uno, for many, came from the first glance at the spec sheet. Rs 34.49 lakh (ex-showroom Delhi) for something that makes just over 20PS more than a Creta? Ridiculous! Surely its 7-seater rivals with more power and torque will obliterate it. Well, the Skoda Kodiaq managed the 0-100kmph sprint in 10.31 seconds - half a second quicker than the Ford Endeavour and nearly 2 seconds better than the Toyota Fortuner. That’s hardly blistering, but thanks to its lighter weight and lighting quick 7-speed DSG transmission, the Kodiaq makes up for its output deficit. And pottering about in it also makes it evident why this particular tune is sought after even in global markets - driveability. No matter how hard you push the SUV, it’s impossible to be caught off guard. Enthusiasts will scoff at the lack of excitement but the honest truth is, the audience being targeted here just wants a comfortable family SUV that’s as easy to drive as breathing. That’s where the 340Nm of torque, delivered from 1750-3000rpm comes in. Low-speed driveability is excellent and there is no lurch/sudden surge in performance. The performance gains are very linear and in the city, the Kodiaq zips through traffic without ever feeling lethargic. In fact, opt for Sport in the drive mode selector and though throttle response gets sharper, it still isn’t jerky, nor does it present any unpleasant surprises for novice drivers. It’s also fairly efficient, managing 13.29kmpl in the city and 16.18kmpl on the highway. In this particular tune, the Kodiaq makes for a great cruiser. Even at 120kmph, the engine is ticking just below 2,000rpm and feels relaxed enough to make it a good ship for the weekend getaway. But at speed, the story turns a bit sour. It is here that you wished for a more daring state of tune. Yes, the engine is very rev happy, especially for a diesel and the 7-speed DSG auto ‘box offers not just quick gear changes, but is also willing to drop down more than a gear or two at a time when required. But the engine just feels strained when you push it. High speed overtakes do need some planning. You can shift down a cog with a flick of the steering paddle and keep it on the boil but the motor drops steam post 3500rpm, following which, thing keep getting louder but not a lot faster. Right now, the performance is just enough but not an inch more. Simply put, at this price, you want performance that feels special and this just isn’t. Moreover, if you’re running with a full passenger load, it will feel underserved. Our impressions haven’t changed from our experience at the first drive. 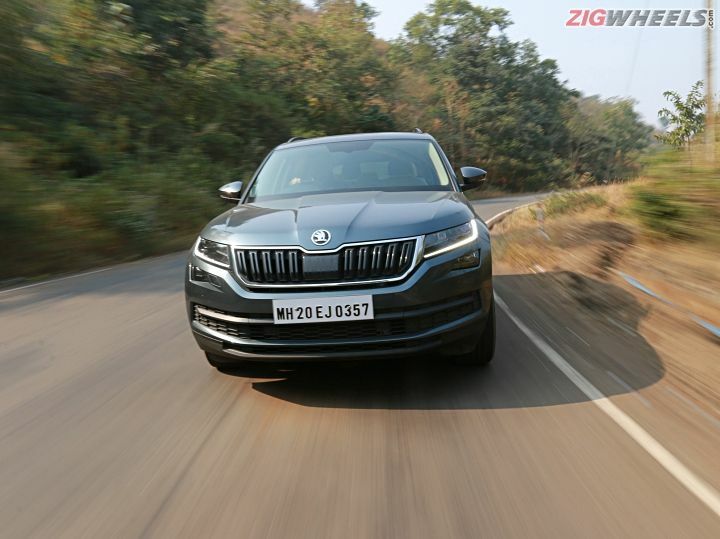 On regular roads, its ride is quite sedan-like and the Kodiaq’s quite flat and stable. This is a very important trait as both its 7-seater contemporaries have a lumpy ride with an ever-present vertical bobbing, particularly in the rear rows. The Kodiaq will be significantly more comfortable over long distance trips. However, there’s no getting around the fact that this is a tall boy SUV. For starters, on undulated roads, there’s a very strong amount of side-to-side movement that plays spoilsport. This is also seen while going through potholed roads, where occupants do get tossed about laterally. Sharper bumps can be felt and heard in the cabin too and there doesn’t seem to be much spring travel. Even smaller speed bumps should be taken slowly because you will feel a jolt in the cabin if you drive it like its rugged rivals. This is no butch off-roader with only 140mm of laden ground clearance and while you’re better off driving through small potholes/patchy stretches quickly (to avoid getting tossed about), larger craters and badly damaged stretches must be taken with patience. Try to fly through them and the suspension crashes through the imperfections, making its disapproval audible. To put it simply, the chassis doesn't feel nearly as indestructible as the Fortuner or the Endeavour but prioritises stability on properly paved roads. See? Sedan-like. As a result, there’s no bounciness. So after exiting a pothole, the Kodiaq settles back immediately. It’s also surprisingly good at cornering for something of its size. No doubt, there is noticeable body roll, but you can stay on the throttle even through downward sloping corners where you'd have to brake in a similar ladder-frame alternative. The steering isn't too communicative but is responsive. Set the steering to Sport mode and it feels heavier while play drops significantly. Unlike many SUVs, the Kodiaq’s 2nd row is quite easy to get into. Even older folks can get in bum first because the floorplan isn’t too high up off the ground. With a minimum knee room of 520mm (maximum = 920mm), two 6-footers can sit one behind the other easily. The seats offer great all round support too and with the lateral head supports integrated into the side headrests, dozing off while your driver gets you to work will be a sweet experience. The middle row is also wide enough for three passengers of an average build with about 1440mm of shoulder room on offer. That said, the seat base gets shorter in the middle and the floor console does foul with the central occupant’s feet. We’d have also liked pillar mounted or roof mounted AC vents like the Endeavour, since your knees can block the air flow from the console quite easily. Quite likely the least used seats in the Kodiaq and, yet, a major reason for choosing the SUV in the first place, the Kodiaq’s last row doesn’t make a great first impression. The 2nd-row seats do slide forward but don’t tumble, leaving a relatively narrow space to get in. You have to mind the roof too since the Kodiaq is just 1676mm tall - 4mm more than the 5-seater Tiguan and around 160mm less than the Endeavour or Fortuner. The best way to get seated is to face the dashboard, put one foot in and then push back into the rear seat. With two EXACT 6-footers in the front two rows, there’s room for one more in the rear, so yes, it is certainly usable and doesn’t feel claustrophobic but isn’t really ideal for adults. The seat sits directly on the floor so your knees point skyward. But the backrest is well-sized and the large headrests reach right up to the roof, so they’re usable too. What would’ve helped greatly is if the backrest reclined, as the default position is too upright. The last row is genuinely a good place to be in for kids or short adults, and even here, the ride doesn’t get much worse than the 2nd row. For reference, for this test, two fat journos sat in the third row while a third drove us through gravel, dirt tracks and smooth roads at varying speeds and we stepped out with no signs of uneasiness. But there is a flaw here and it’s a big one - the lack of AC vents. You can feel the airflow from the front vents in the back but in hot weather, the cooling WILL feel inadequate. Additionally, to help cool the rear, occupants up front may have to deal with a chillier climate than they’d have liked. ..loaded to the gills with features. The 8-inch touchscreen infotainment system is big, comprehensive and smooth enough to make using it a breeze. The 10-speaker Canton sound system also leaves little room for complaint once you get the equalizer settings right but yes, it doesn’t deliver an experience as good as the Superb’s 12-speaker setup. While we do have some gripes with the placement of the 2nd row AC vents and lack of them in the last row, the 3-zone climate control system, otherwise, works very well even in our weather. It still isn’t clear why Skoda skipped ventilated seats, at least up front, considering the Superb gets them. At a price of nearly Rs 35 lakh ex-showroom, they certainly haven’t gone aggressive with the pricing, so why the omission? Otherwise, the features list is hard to beat, including full LED lighting, 18-inch wheels, a genuinely panoramic sunroof, cruise control and nine airbags. It’s also plenty practical with 270-2005 litres of boot space available, complete with baggage hooks, a cargo net and a boot cover with a dedicated stowage spot in the boot floor. The Kodiaq is not an SUV in the traditional sense. It’s amply clear that if you want something that’s game for punishment, this isn’t the right choice. On the road, the ride is better than its ladder-frame rivals but it doesn’t hold a stone to them when it comes to the rough stuff. We also wish it had a more powerful engine tune, just to make it more capable and enjoyable at higher speeds, to satisfy more than just need-based driving. But if you want a premium 7-seater family SUV that’ll do the office runs, the weekend getaway or a trip to the farmhouse, it does make a compelling case. Its rivals are outmatched when it comes to quality and attention to detail and if you’re looking at primarily urban usage, arguably, it makes more sense than them too for its more mature manners. Also, it’s not something that catches too much attention, which is a deal maker or breaker, depending on your preference. Finally, it does function quite well as a 5+2 seater, while offering great practicality at the same time.